Tim Thomas didn’t comment yesterday on the firestorm he created Monday by declining an invitation to the White House. 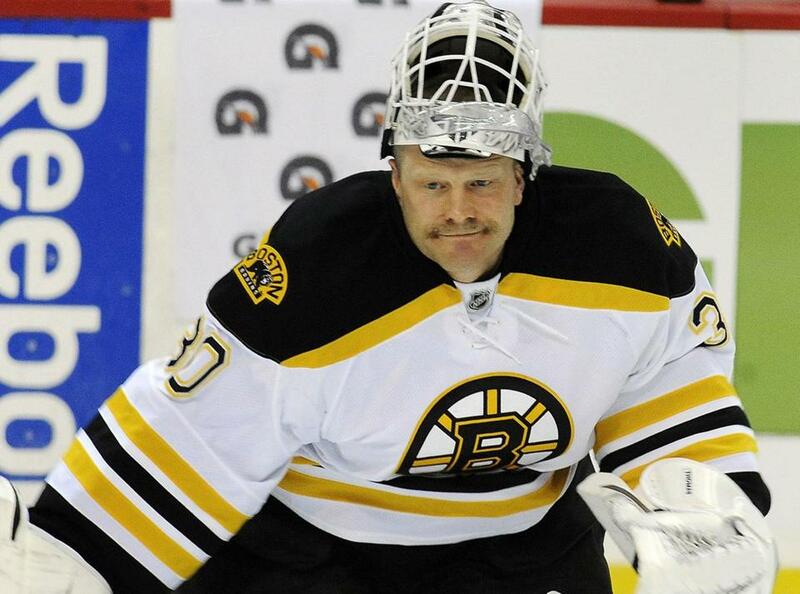 WASHINGTON - For several months, Bruins personnel ranging from owner Jeremy Jacobs to the rank-and-file players knew that Tim Thomas wasn’t planning to attend Monday’s ceremony at the White House. None was surprised that Thomas, one of two Americans on last year’s Stanley Cup-winning roster, would be the lone dissident. It was Timmy being Timmy. On Monday, Thomas ignited a firestorm when he declined the invitation to tour the White House and meet the president, a privilege granted to all championship-winning athletes. According to Bruins director of communications Matt Chmura, the team decided to withhold Thomas from an afternoon charity appearance at the Boys & Girls Club of Greater Washington because his presence would have been a distraction. Monday night, Thomas, a native of Flint, Mich., released a statement on his Facebook page explaining that he declined to visit the White House because he believes the federal government is out of control. The Capitals’ Mathieu Perreault beat Rask three times as the Bruins lost for the second time in three games. “It is what it is,’’ Bruins winger Milan Lucic said. “I don’t think it really matters what I think about it. I still enjoyed the day and took part in the opportunity. Thomas declined to comment yesterday. All in all, according to the team source, Thomas’s actions detracted from a day of celebration, which included a White House tour and a ceremony in the East Room. It was an act in sharp contrast to the team-first approach the Bruins believe led them to the Cup last season. “I think our group is all mature enough to look past that,’’ said coach Claude Julien. “Our group was very proud, honored, and privileged to have gone to the White House. Before last night’s game against the Capitals, Julien was asked whether Thomas’s act of putting himself before the team would cause problems with his teammates. Julien was loath to answer the question, preferring to focus on the Capitals. “I don’t think I want to stand here and answer these questions today when we’ve got Washington tonight,’’ Julien said. “Our biggest concern right now is about winning this hockey game. It’s also about leaving [before] the All-Star break with a win under our belt and hopefully having a chance to be in first place. Two team sources think Thomas’s decision won’t have a negative effect inside the dressing room because it reflects no deviation from his character. Separately, the sources both said Thomas’s actions merely revealed what his teammates have known since 2006-07, his first full season with the Bruins: that he is a solitary, me-against-the-world figure who often puts himself in front of the team. In Thomas’s statement, he did not mention the Bruins nor his teammates. He concluded it by saying it was a choice he had to make as an individual. Such is the personality that has left Thomas with few friends among the players. But it’s also the attitude that has made Thomas a two-time Vezina Trophy winner, the reigning Conn Smythe Trophy winner, and the Bruins’ most important player. Thomas views himself as an underdog as unique as his puck-stopping style. He has used multiple career snubs - the Avalanche (formerly Nordiques) assigned him to the AHL after his first NHL camp, he went unclaimed on waivers when promoted from Providence to Boston in 2005-06 - to stoke his competitive fire. In 2009-10, Thomas was slowed by a balky hip that required offseason surgery. Tuukka Rask claimed Thomas’s job as the No. 1 goalie. Before the start of 2010-11, Thomas said he had something to prove, not just to the organization, but to the world. Thomas proved his words correct as he submitted his finest season. Yet one of the Bruins’ primary concerns leading into 2010-11 was how to manage Thomas if Rask held on to the starting job. Front-office members wondered whether Thomas, as a backup, would be a good teammate. The point became moot. On Monday, general manager Peter Chiarelli acknowledged he had spoken with Thomas several times over the last two months to discuss his decision regarding the White House. Chiarelli said he would not suspend Thomas for missing the event. Yesterday, Chiarelli declined to comment on Thomas’s actions; he referred to team president Cam Neely’s statement on Monday. Neely said the Bruins were disappointed in Thomas’s absence and that the goalie’s viewpoints didn’t reflect those of the Jacobs family or the organization. Thomas’s decision, however, may be the first step in goalie and team parting ways. His no-movement clause expires at the conclusion of this season. Thomas has one more season remaining on his four-year, $20 million contract. Rask, a restricted free agent at year’s end, should be ready to assume the starting job in 2012-13. If the 37-year-old Thomas (20-9-0, 2.12 goals-against average, .933 save percentage) maintains his current level of performance, the Bruins could reap a significant return from a club seeking a No. 1 goalie. Thomas has strong New England ties. He lives north of Boston and sometimes takes vacations in Vermont. He is a University of Vermont graduate. Thomas plans to live in Colorado Springs upon his retirement. Steven Kampfer was the only other American on last year’s Bruins roster. Kampfer, a University of Michigan graduate and a native of Jackson, Mich., said he enjoyed the White House ceremony. “It’s Timmy’s decision. It’s his beliefs. It’s his right to do what he wants,’’ Kampfer said. “We all had a great time going there and seeing the White House.